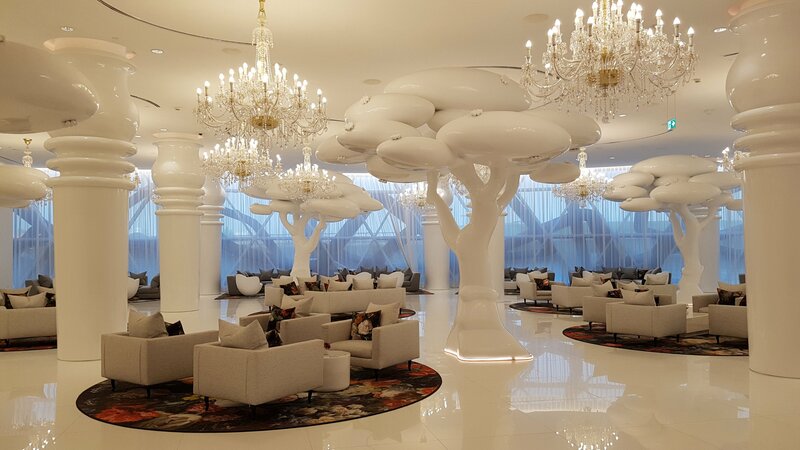 Experience a visual enchantment upon entry to this new hotel. 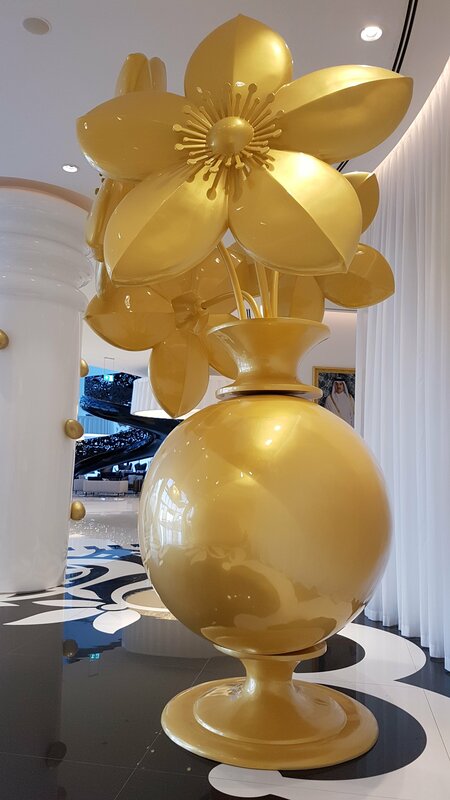 With several artworks and decorations around its lobby, you will somehow feel you are being transformed to another world: the giant golden flower vase right at the entrance, the now popular black spiral stairs, the frozen forest lounge… and more. 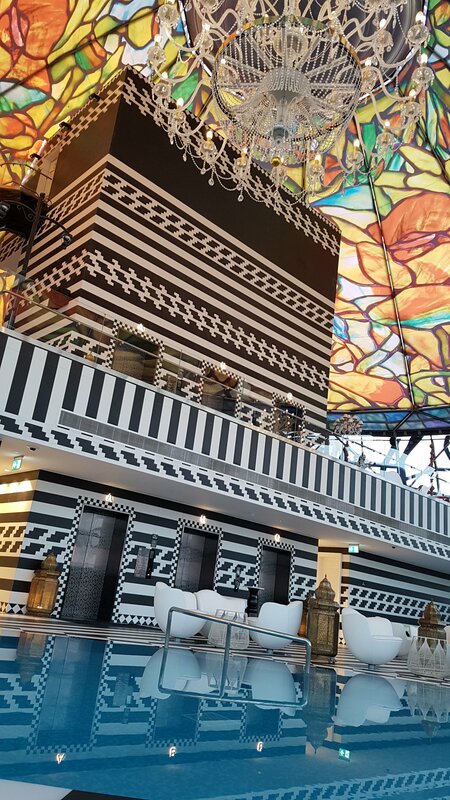 These things will immediately tell you that you are up to something unique and extraordinary… a fantasy-like environment that is true for all Marcel Wanders designs. And yes, we had a complimentary stay at this beautiful hotel courtesy of my win from their social media contest – “UNLOCK_MONDRIAN” in line with their grand launch promotions few months back. It was really unexpected and it was definitely a great experience for us. With the rise of social media and its seeming importance in the lives of people to document practically every moment and every beautiful things we see, it is quite obvious that many establishments also bank on this phenomenon, thus the rise of “instagrammable” restaurants, cafes and now… hotels. As a security feature, hotel guests will be able to access the lift using their room key card. Swipe the card and the screen will ask which floor you are going and the specific lift you will take. There’s no need to press any button as it will automatically close and open up to your specified floor. 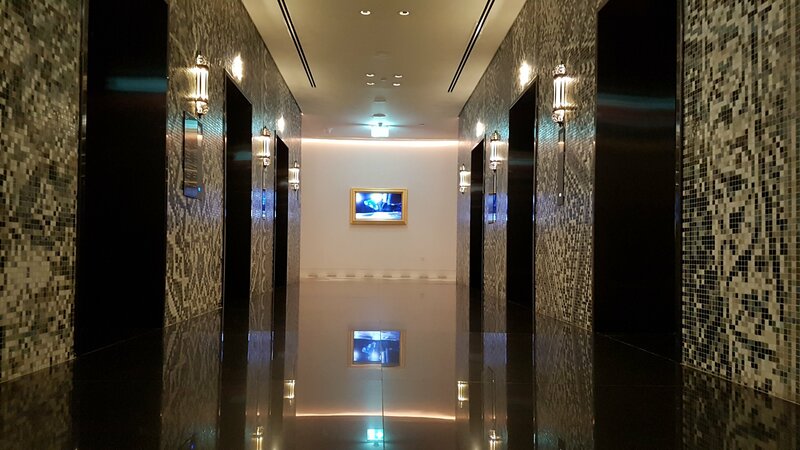 The high speed elevator also looks classy with its black mirrors, digital monitors, and images of popular horses owned by the royal family. There are also floor guides/directories for easy reference (restaurants and other shops in the hotel). The standard room size (around 48sqm) is perfect for a small family like ours, with all the basic amenities in place including a beautifully designed bathroom area. 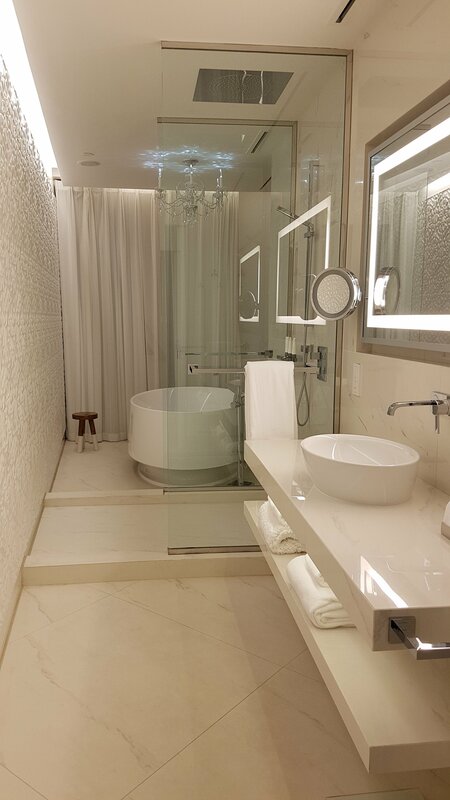 The generally white feel at the bed area appealed to me the most, while the 3D flower sculptured walls at the bathroom is hands-down my favorite. 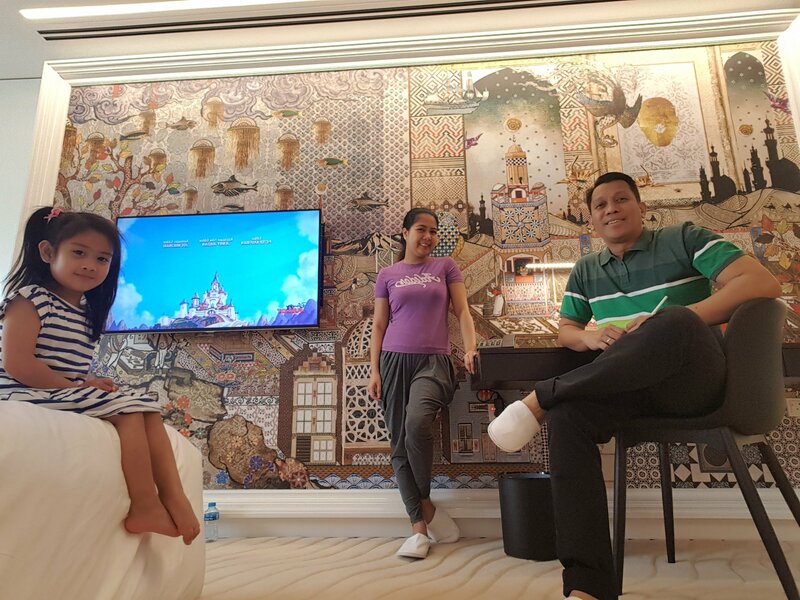 The division wall (as some may have seen it on my instastories), is decorated with artsy wall paper which looks good in contract to the predominantly white tone of the room. 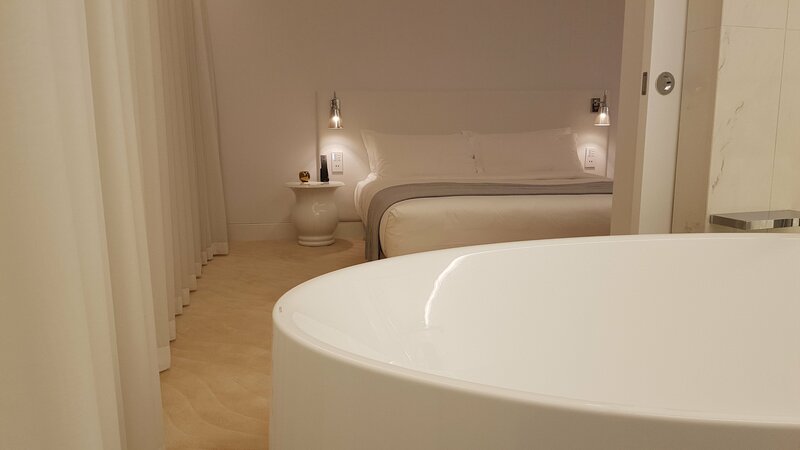 The tub, which can be accessed through the bed or the other side of the bathroom area, gives it a free flowing feel. A swarovski chandelier above an artificial stone bathtub can be perfect for that soothing bubble bath (unfortunately, it’s not really our thing and having a toddler who thought that it’s a bigger version of her bathing tub… then she would always take that romantic moment away from us). While we don’t have a clear and big window that is usually expected in a hotel (as our room is located in one of those diagonal designs flowing at the hotel’s exterior side), we are the type who prefer to explore around the hotel or can be content staying indoor watching TV or lie down on the bed. 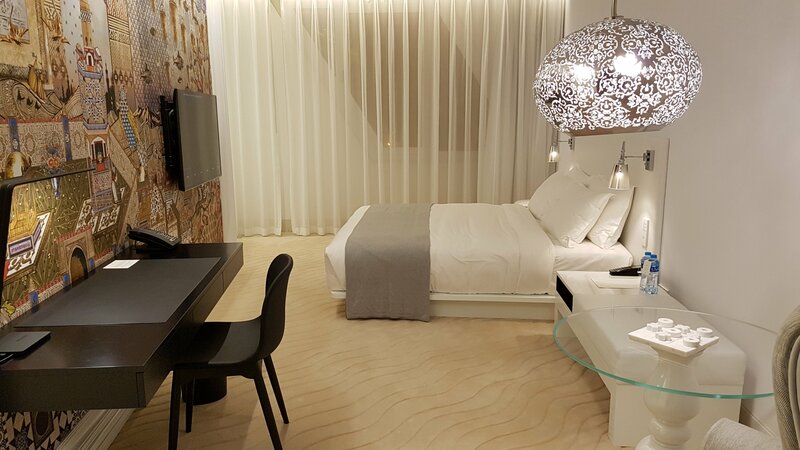 We definitely love the fluffy bed and the dunes-sculptured carpeted floors and we even enjoyed playing the marbled tic-tac-toe provided in the room. And I bet, the more upgraded suites would be even more iconic! Initially, they have three restaurants and a pastry café in operation as of the moment. That, in itself, could make the guests feel comfortable that they don’t need to go out of the hotel for food. Surprisingly, a quick trip around them revealed that these restaurants definitely live up to their brand standards, and I was simply amazed. I could say that they are the hotel’s aces and each one has its own character. The staffs are super friendly and accommodating, and the interiors are jaw-dropping. 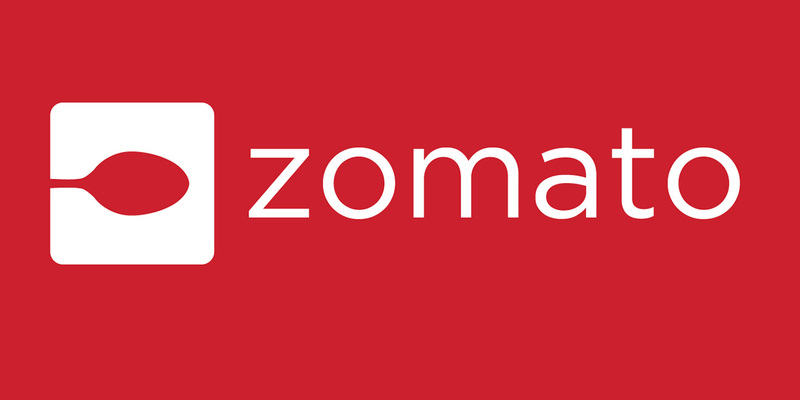 These internationally-acclaimed restaurants serve consistent and excellent food that their brands are known for. We have tried some of them and the others will be our reasons to come back for more! 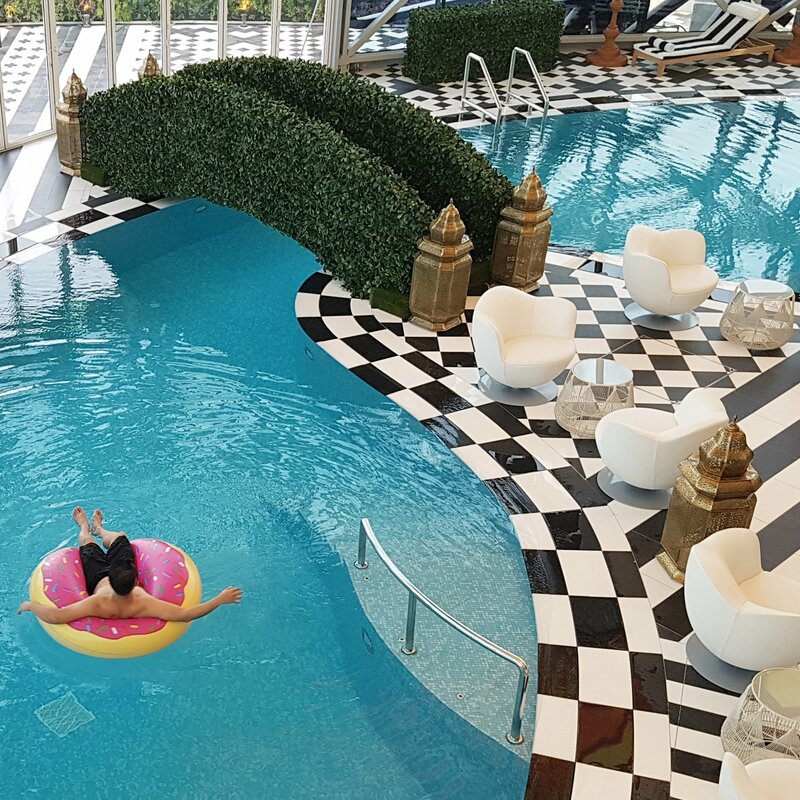 Ahhh, the swimming pool of Mondrian Doha… every spot is worthy of a shutter click. Located at the 26th floor, this indoor amenity shares the space with their fitness gym and separate changing rooms for boys and girls. 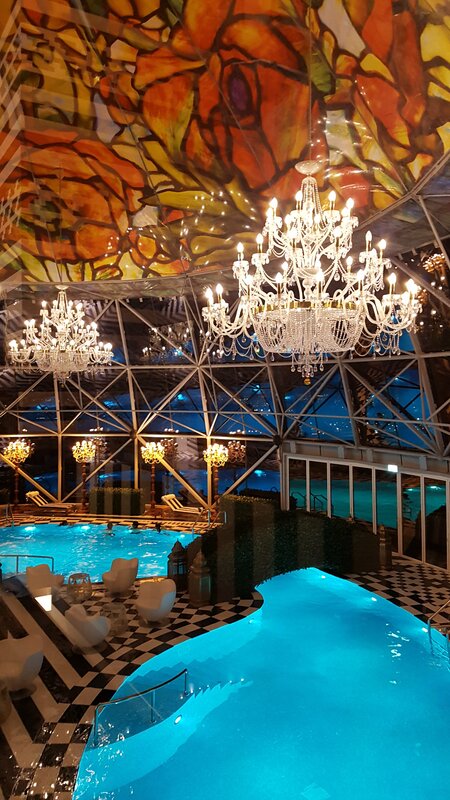 The dome shaped roof with colorful floral mosaic designs pretty much gave it a regal look. The hanging chandeliers and standees added to the elegant-feel of the place. The black and white tiles and the glass windows with its extensions framing similar with its basement that appeared “carved out like a nest”, makes it look bigger and open. Though the pool is generally for adults, children should be accompanied and/or strictly supervised. However, they also have available lifeguards and they provide arms bands and inflatables. While the pool opens a bit late and closes quite early (8am to 8pm only), one has to plan out their schedules wisely (for breakfast and dinner) in order to maximize the use of the facility. We had an early morning dip right before taking our breakfast and we had the pool all for ourselves. 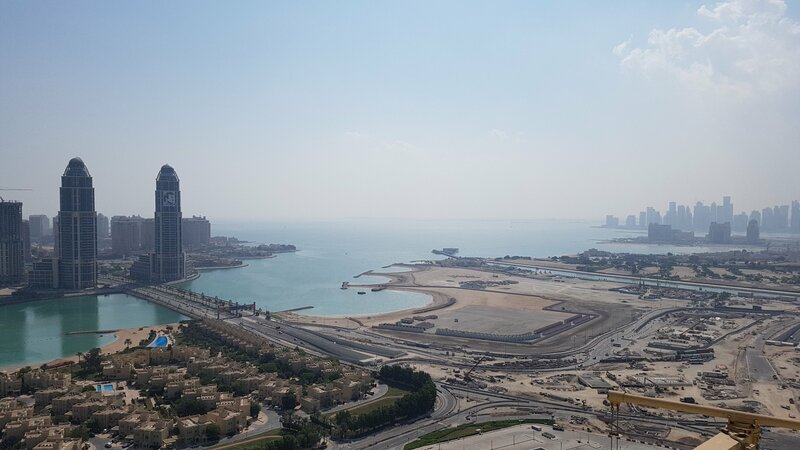 Climb up to the hotel’s roof deck and you’ll have a magnificent view of the Westbay skyline on one side and the Pearl Qatar on the other side. It provides as perfect spot for a sunrise shoot with The Pearl as your backdrop… as well as a great location to get a bird’s eye view of the man-made island during the golden hour in the afternoon. You will also have a glimpse of the ongoing road constructions which promises to be ideal for light trail photography when the expressway development is completed. 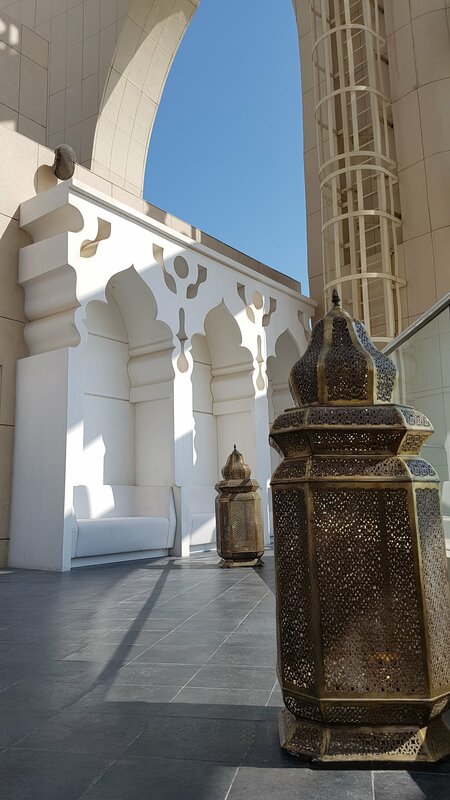 Right upon entry at the hotel premises, where the MONDRIAN DOHA fountain marker is, is the entrance to the grand ballroom. One would think that it’s a rather unique approach to have the main lobby at the back side fronting the Lusail marina. I was passing by it early morning and the side door was left open. But when I asked if I can take a photo of the interiors, the guard politely declined my request. But mind you, from what I saw, it was so spacious and grand I could imagine how they initially planned out their supposed grand launch (which was rescheduled to a later time). And just before we checked out, our friendly room boy said that the hotel was busy because of a big wedding scheduled that afternoon. With its strategic location, guests will have access to many other destinations like Lagoona Mall, The Pearl-Qatar, Katara, and even the future Lusail City. 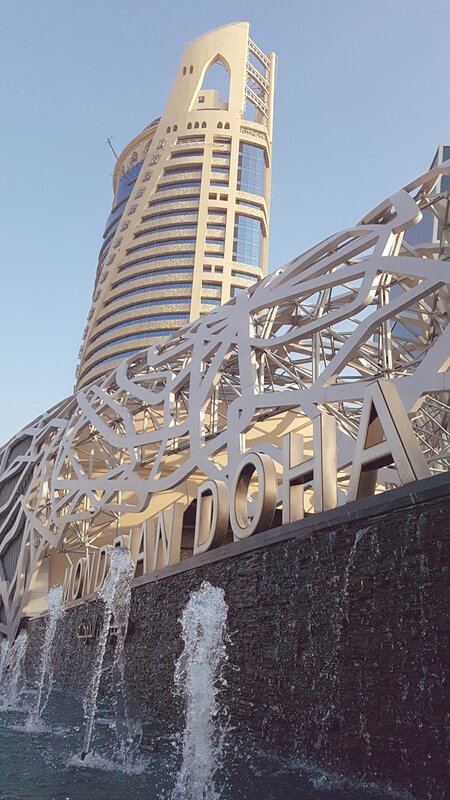 Especially for guests taking a transit tour or a short vacation in Qatar, Mondrian Doha is a place to experience impeccable service and excellent amenities. 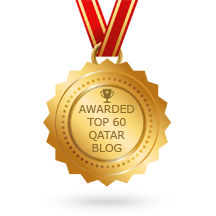 Mondrian Doha is one of the latest additions to the growing number of international hotel brands in Qatar. While understandable during their initial operation stage, some staffs aren’t familiar yet with some of the hotel details. However they are quick to compensate with their desire to help, they won’t leave you hanging. I also have some minor concerns with the space on one of the elevator door shaft (about an inch) that it might get some heels stuck-up, which I hope they get to fix soon. Also, the hotel might want to consider having a safer alternative walkway to the mall. However, we had a wonderful time during our stay at Mondrian Doha. I wouldn’t hesitate recommending it to everyone and I believe it is one of the most beautiful hotels I’ve ever seen. 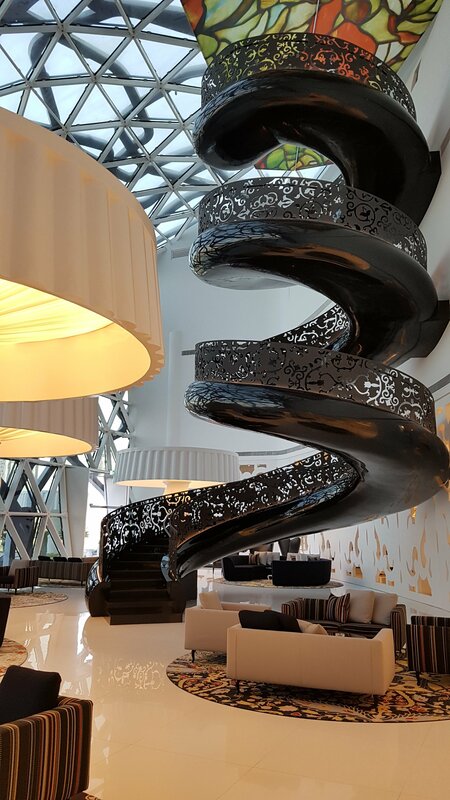 While it is in the premium range (at a discounted rate of QR880/night – opening rate), the facilities and amenities aren’t only instagram-worthy but the over-all experience is really one-of-a-kind. Aw. Il be waiting for those beautiful shots too. Enjoy!